The Valley’s northern parliamentary seat Baramulla went to the polls today, albeit quietly. The Baramulla parliamentary constituency comprises three districts — Baramulla, Kupwara, and Bandipora — and fifteen Assembly constituencies with more than thirteen lakh voters. It recorded a turnout of 32.41 percent at the close of polling. Thursday’s poll percentage was a significant increase from the dismally low polling recorded during the 2017 Srinagar bypolls (7.14 percent), the lowest since the eruption of the separatist violence in the late 1980s, when violence led to the deaths of eight civilians in clashes with security forces. Threats from jihadists have been a routine feature of elections in the Valley. Now, a growing consensus to elect leaders to represent the Valley is being shaped by the victory of the Bharatiya Janata Party in the local body elections last year, leading to fears of abrogation of the laws granting the state a special status, and "heavy-handed" security measures in the absence of an elected government. 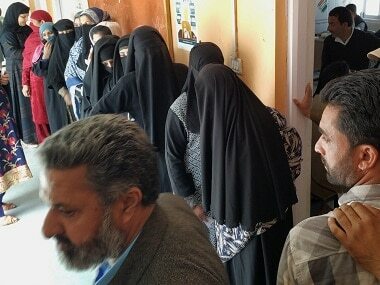 Outside the polling station where Qadir cast his vote, others shared his concern. “Ever since the articles were made a target, people haven’t been able to think clearly,” remarked a resident of the town who did not wish to be named. This local said he has seen the rise and fall of bunkers in Kashmir, a metaphor for the cycle of violence and calm, but has never witnessed an uncertainty has set in “after the PDP joined hands with the BJP”. The National Conference has become a strong contender in Handwara, considered to be the stronghold of the former separatist turned unionist People's Conference chief Sajad Lone, who is struggling to shake off the baggage of his association with the BJP. Party members, however, are confident of taking the lead in five constituencies owing to a reduced electoral participation. Additionally, Abdul Rashid, the Valley’s maverick former legislator from Langate constituency, is also in the fray as an Independent candidate. “His candidature has boosted our confidence as we think he is more likely to cut into the NC’s vote and not ours,” claimed a People's Conference worker. In Rashid’s constituency, polling officials sat idle at a station at the Langate main market area, the classroom turned polling booth was painted with graffiti naming jihadist militants. Polling stations outside the main market area reported greater participation. At the nearby Madagam village, more than 400 of the around 2,000 voters cast their ballots. Some voted for the People's Conference, others for the NC, and still others for Rashid. Some children pretended to cast their vote, although their demand was real: A ground good enough to play cricket. Aijaz Ahmad Wani, professor of political science who recently published a book on governance and politics in the Valley, said it would not be surprising if the voter turnout would be at par with previous elections. “The current situation is going to push the public to rethink electoral politics,” he Aijaz said. He added that a “choking situation” would eventually shape a consensus that some form of local governance is needed because at the end of the day, it would be “local parties who are answerable to locals”.